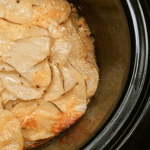 A very mouthwatering potato dish you can easily prepare. I have discovered another amazing potato dish that I just can't keep to myself. It is one of those dishes one should definitely share with all the slow cooking friends one has. This s one of those dishes that would make you experience a really feel good dish. It is the very definition of comfort food at its finest. It only takes a couple of minutes to prepare either before you leave for work or on a weekend before you start any start any chores. Just leave it to cook and then enjoy a home filled an amazing buttermilk aroma that will tickle you senses. In a large bowl, season buttermilk with salt and pepper. As you slice the potatoes, put the slices into the buttermilk to soak. 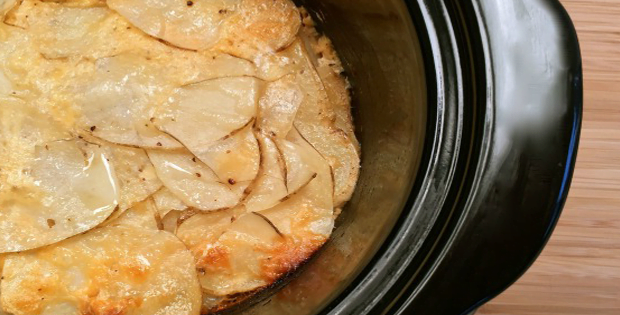 Layer the buttermilk soaked potato slices with little pieces of butter and cheese in the crock of a slow cooker. Put the lid on and set for high. Cook for about 4 hours, or until the potatoes are 185(F) and cooked through. Turn off the slow cooker and allow to rest 15-20 minutes before serving. Garnish with crumbled potato chips and bacon bits if desired. Serves 10-12. I used a 6 quart slow cooker. But I am pretty sure a lot of you have known this recipe for quite some time now. As it was my first time to try it, I was left speechless. Well, just imagine my kids and hubby amazement considering that they love potatoes and cheese. I strongly recommend you try it out too for you to find out why we are crazy about this dish. Watch the full recipe video. Like & share Lazy Oven! Get slow-cook recipes directly in your feed.